Today’s pulled pork sandwich is a bit of a departure, since it does not feature pork. The Duck Deli, located in the minuscule town of Duck in the Outer Banks of North Carolina, is locally famous for its in-house smoked meats. Said meats can be fashioned into meals or platters for in-house or takeaway dining, or you can simply opt to carry out an entire chicken or side of beef or whatever you desire. I had gone into the Duck Deli with my eye on the Chopped Texas Beef Brisket Sandwich, but was informed that they were fresh out of brisket. Looking over the remaining sandwich options, I felt compelled to opt for the Pulled Chicken over the pulled pork option. Chicken that comes with a smoke ring is a rare occurrence (or at least, rarer than it ought to be). 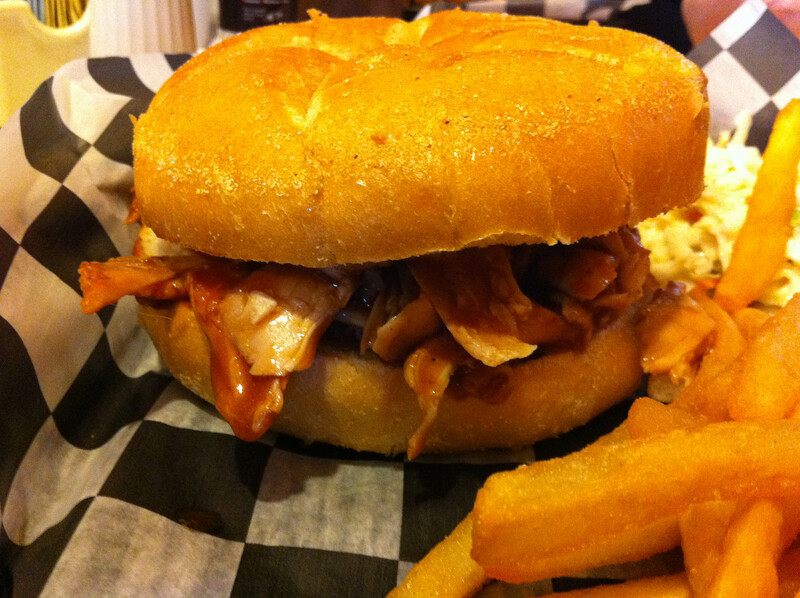 The pulled chicken came as most pulled pork sandwiches often do: meat and sauce on a bun. No need for putting on airs. The chicken was indeed quite good and flavorful, and the sauce was just fine. The only real downside was that the bread was a bit too spongy. Good for soaking up sauce and containing a potentially messy sandwich, but bad for chewing and swallowing. This was a slightly above-average sandwich, but showed the pulled meat genre often stands on its own. You needn’t add bells and whistles to have a satisfying sandwich. If the meat is the star of the sandwich, you oughtn’t drown it in a gimmicky sauce. One needs to have confidence in the ingredients. You’ll find, more often than not, that they will sort out the rest. 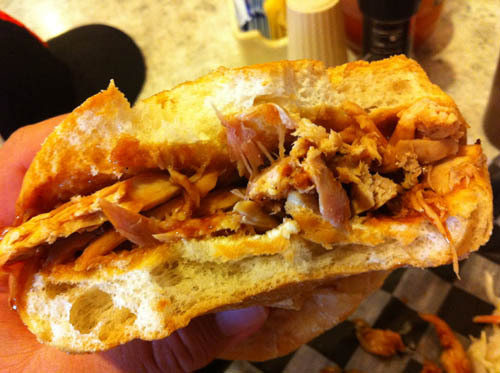 This entry was posted in General Sandwich Discussion, Sandwich Reviews and tagged Chicken, North Carolina, Pulled Porkstravaganza, Reviews by Bill, Sandwiches I Have Eaten by bengrimm. Bookmark the permalink.